Back in January of 2016, a song Woody wrote in 1950 about his landlord “old man” Fred Trump made the news. This weekend, the Beach Haven apartments where Woody lived were the subject of another New York Times investigation. It’s the story of yet another rent-raising, tax-dodging Trump family scam, and focused on the ordinary people the Trumps cheated. Those buildings have been home to generations of strivers, municipal workers and newly arrived immigrants. When their regulated rents started rising more quickly in the 1990s, many tenants had no idea why. Some heard that the Trump family had spent millions on building improvements, but they remained suspicious…. At this point, what else is there to say? We all know how you feel, Woody. Everybody sing along. Back in 2014 I wrote about a film called Palikari — Louis Tikas and the Ludlow Massacre. Directed by Nikos Ventouras and produced by Lamprini Thoma, the film tells the story of Greek and other immigrant miners during the Colorado Coal Strike of 1913-1914. The other day, our friend Michael Kleff sent word that Palikari screened last month in Trinidad, Colorado, at an event commemorating the life and work of Louis Tikas. 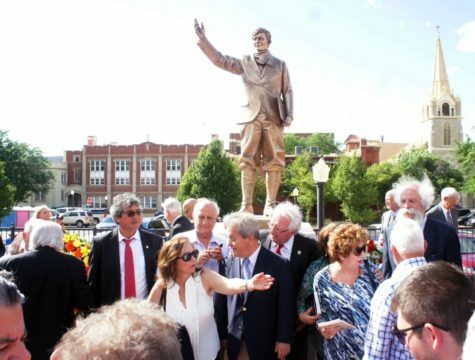 A statue of the Ludlow Tent Colony leader was unveiled. This was a local event, but it occurs to me that Palikari and 1913 Massacre would make a great double feature anywhere, especially now, at a moment when there are powerful forces trying to demonize immigrants (we all know who’s leading that charge), undo the accomplishments of the labor movement (witness the recent Janus decision), and generally distort and whitewash American history. Remember, also, that Woody Guthrie wrote and played “1913 Massacre” and “Ludlow Massacre” together, as “a group of two” songs. He read about both tragic incidents in the same chapter of the same book: Ella Reeve Bloor’s We are Many. The chapter from which Woody wrote these songs, sometimes lifting whole phrases, is called “Massacre of the Innocents.” 11 children died at Ludlow; 59 in Calumet. 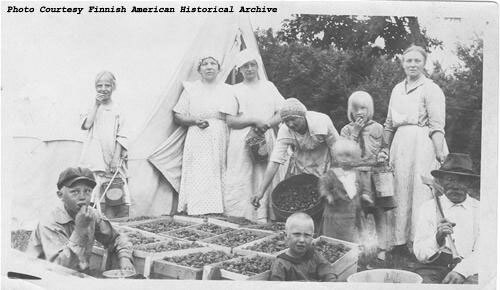 In both places, immigrant children — innocents — found themselves on the frontlines of a violent struggle not just for better working conditions, but for basic human rights, and for an idea of what the country could be that we now abandon at our peril. 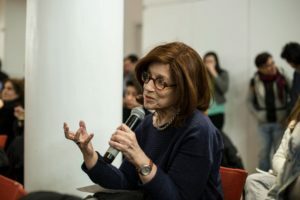 Back in September of 2012, when Ken and I had just finished 1913 Massacre, Deanna Kamiel invited us to screen our new film for her graduate documentary filmmaking class in the School of Media Studies at The New School. Like other screenings in the DOC Talk series, it included a videotaped Q & A with the filmmakers, which Deanna moderated and produced. At the time, we were on our way to Calumet — where we would hold the first public screenings of the film at the Calumet Theatre. We were bringing the film back to where it came from, back to the town and the people it was about. When we mentioned our upcoming trip during the Q & A, Deanna said that George Stoney had done the same thing with Uprising of ‘34 (his film about the General Textile Strike in the south). That was all we needed to know we were on the right track. Deanna kept in touch throughout our Calumet trip, and encouraged us after that to take the film to Twin Cities Public Television in Minnesota — where it was broadcast on Labor Day of 2013. Ken emailed yesterday to let me know that Deanna had passed away over the weekend. We will remember her as a teacher, friend, and guide. 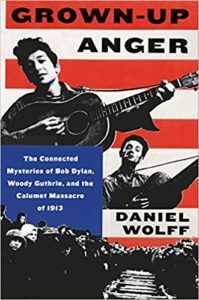 Here’s a holiday gift idea for the Bob Dylan fan in your life: a copy of Daniel Wolff’s Grown Up Anger, tracing the connections between Woody Guthrie, Bob Dylan, and the Italian Hall disaster, and a DVD of the film 1913 Massacre. Seamless editing, engrossing interviews and a stirring well-integrated music soundtrack make the film flow like long lost friends catching up on history… It joins the ranks of great progressive movies. You can buy the DVD right here, and order Wolff’s book on Amazon. Woody Guthrie and Arlo Guthrie fans will love it, too! 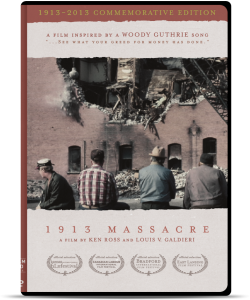 Just in time for Woody’s birthday — he’d be 105 years old today — a new book about 1913 Massacre by Daniel Wolff: Grown up Anger. Wolff’s book explores the deep personal, cultural and historical connections between Woody Guthrie and Bob Dylan, following a trail that leads from Dylan’s “Song to Woody” through “1913 Massacre” to Christmas Eve, 1913 in Calumet, Michigan. This is a dimension of the 1913 Massacre story we explored in making the film, but which — for all sorts of reasons — never made it into the film. In our editing system, there’s still an unfinished scene, cut from 1960s protest footage, with “Song to Woody” as the music bed. There’s some consolation in the fact that the scene that we never realized in our film has now gotten the book-length treatment it warrants. Put Daniel Wolff’s Grown Up Anger on your reading list. Check it out. Not a bad suggestion, but Dylan’s “Song for Woody,” which he set to the tune of “1913 Massacre,” is really the better place to start tracing Dylan’s journey and to appreciate the act of self-creation that turned Robert Allen Zimmerman into Bob Dylan. 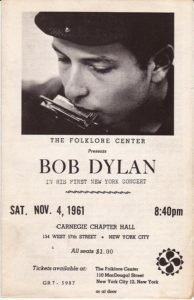 Dylan still performs the song — or, more accurately, he started performing it again around 1999 and 2000. The original recording appeared in 1962. 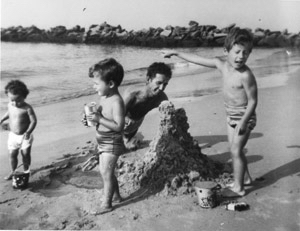 Well I remember the day in 1961 when Bob Dylan came to our house. I was 13 years old. He must have been 20. And ah, he wanted to know where my dad was. And I told him he was down the road, you know he was in the hospital at the time. And the next, within the next few years, there was this massive human undertaking around the world, this great drama of events being played out. And the sound track was Bob Dylan songs. It was an incredible. I mean not just Bob Dylan songs, but they were a major part of the sound track of the times that were going on. And I think one of the reasons that that probably happened was because he had taken this technique of talking about serious issues, reading the papers, going to places where people were struggling. Writing their stories from their point of view, and doing it with such poetry and such power. Such simple music. Nothing complicated in these Bob Dylan music songs. But poetically, verbally, text-wise, mighty powerful imagery, that goes beyond the average ability of a mind to foresee what’s coming next. It was always surprising. And not only that, half the time it was angry and pissed off and wonderfully so, because he was angry about the same things that everybody else was angry about so when we heard a Bob Dylan song he was speaking for us. In the same way that I think my dad had spoke for a lot people a generation before.